Hybrid tea roses and the original tea rose are the world’s favourite roses and are available in many gorgeous colors. 1. Hybrid tea roses are among the most beautiful flowers in the world. They are the florist’s rose. 2. The blossoms are fantastic and each flower can have as many as 60 or more petals. You can not find a more beautiful cut flower. 3. The fragrance also makes the hybrid tea rose an excellent choice to give as a bouquet or to grow in your garden. 4. Hybrid tea roses are different from other roses because they produce their flowers usually one bloom to a long stem rather than in clusters. Most hybrid tea roses produce flowers during the entire growing season and the plants grow 3 to 6 feet tall. 5. Caring for hybrid tea roses is no more difficult than other roses although you do need to give them special care in colder climates. They are no more or no less pest or disease resistant than other kinds of roses. 6. ˜La Franceâ” was the first hybrid tea rose grown in 1867 by a French nurseryman, Jean-Baptiste Guillot. He cross-bred two old garden roses and developed an entirely new kind of rose. 7. 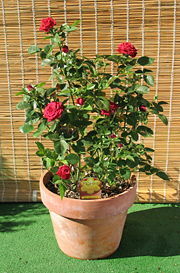 Hybrid tea roses should be planted 18 to 36 inches apart or they can be planted with other flowers in large pots. 8. There are hundreds of choices when looking for hybrid tea roses. Choices can be made by color, names or fragrance. There are hybrid tea roses named after famous people including presidents and their wives. 9. 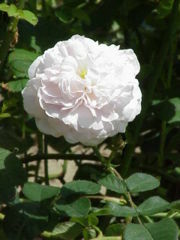 The very first tea rose was a cross between a China rose and Rosa gigantea. These plants are more bushy than the hybrid tea rose but the well-shaped flower buds remind us of today’s modern hybrid tea roses. Tea roses come in shades of white, pink and yellow.